Both bars are "HEAT TREATED." Orange and silver in color. MEB-5 is our economy bar that is 34" in length, 6.3 lbs. each. Not heat treated. Solid orange in color. MEB-4 is a strong basic bar for the economy minded, weighing 5.5 lbs. Solid orange in color. Strong one piece cast steel construction. 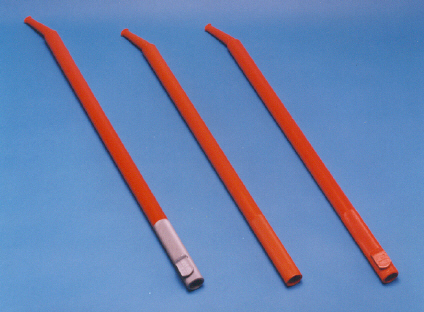 A specially designed chain binder end allows the user to maneuver the bar on or off a tightened load binder easily because of its unique design. Always Stand Aside from the winch bar to prevent injury in case of slippage or severe chain binder "Kick" upon opening. When tightening or loosening winches, always maintain control with a firm grip on the winch bar. When adjusting strap tension, be sure winch sprocket and pawl are fully engaged before releasing pressure on a winch bar. 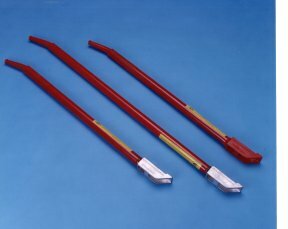 Do not use a bar extender or "cheater" in addition to the winch bar. Use combination bars only to release chain binders which have tightened excessively due to load shifting. Do not use a bar to tighten chain binders. Chainbinders should be tightened by hand only. Failure to comply with above safety recommendations may result in serious personal injury to yourself or those around you!